Before celebs like Alicia, Oprah, Ellen and Martha started making veganism mainstream and vegan cupcakes became fixtures in bakeries across the country, there was The Post Punk Kitchen. Co-hosted by Isa Chandra Moskowitz and Terry Hope Romero from 2003 to 2005, right off the bat the NYC public access vegan cooking show took on sushi and of course, cupcakes. Since then, the dynamic veeg duo have co-authored four cookbooks with a fifth on the way, making them best-selling authors. I caught up with Romero to find out about memorable PPK moments, cookbook authordom, and that life does get better than high school. Kitchen La Bohème: When did you become vegan? Terry Hope Romero: I started out vegetarian at the age of 16 in the late ‘80’s. In suburban New England this was a rare thing indeed, and my two best friends and I did our best to be our own little vegetarian gang. We knew one vegan — the first one I ever met — a young English teacher who would show us PETA videos in class (instead of the same old vocab drills) and bring us samples of soy jerky to taste. But being completely vegan at that time and in the ‘burbs seemed kind of impossible. Later on after college I moved to NYC and for the first time I met a whole slew of vegans my age. From there it was easier to start dabbling in vegan cooking, not to mention how much easier it is to find great vegan meals and supplies in NYC. KLB: You co-hosted The Post Punk Kitchen on NYC public access cable with Isa Chandra Moskowitz from 2003-2005. What's the most memorable moment you can think of about filming it? THR: There are really so many of them it’s hard to pick just one that stands out. A few great ones were how crazy nervous we were the first time we shot an episode — considering it was just the two of us and our two friends filming us in Isa’s cozy kitchen — you would think we were presenting a TED talk to an audience of hundreds. Then there was the time we were chopping these huge onions, talking about how to carefully chop onions, and suddenly we were assaulted by waves of onion fumes and we burst into tears. Running mascara and all, it’s caught on film of course! And working with the bands was always great. Watching little, ferocious Julie from Made Out Of Babies jumping all over the living room furniture and smashing matzos for matzo meal was amazing. KLB: How did you decide to become a cookbook author? THR: From doing The Post Punk Kitchen show, the opportunity to work on a cookbook with Isa arose and I went for it. 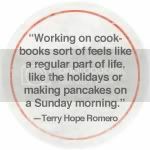 Since then, working on cookbooks sort of feels like a regular part of life, like the holidays or making pancakes on a Sunday morning. KLB: What's your favorite recipe to make at home? THR: I get into food sprints where I’ll make a few versions of one thing for days or even weeks. Usually it’s mini pizzas cooked in cast iron skillets, or peanut avocado sushi, or when I need comfort food it’s black beans, rice and some kind of plantain. Kale salads are big on my rotation too. And green smoothies when I’m really lazy and want to drink my vegetables. Muffins of all kinds happen when I need to bake and want to use up my ever-growing collection of whole grain flours. KLB: Your first solo cookbook, Viva Vegan! hit book stores recently. What's your favorite foodie memory of growing up with Venezuelan roots, and how did becoming vegan change the way you viewed traditional Latin meals and cuisine? THR: Cachapas! These are fresh corn pancakes that are so Venezuelan, my family had a hard time recreating them here in the states. The kind of corn we grow here, sweet corn, is very watery compared to the varieties grown in Latin America and our pancakes would always fall apart, so I didn’t really have a proper cachapa until I visited Venezuela at 13. Since then I’ve figured out a way to make authentic tasting ones that are vegan, too. Applying vegan cooking techniques to Latin food is something that felt natural to me, maybe because I had been cooking most of my life and the ingredients that seem so Latin to me: avocados, plantains, beans, cilantro, cumin, etc, are naturally vegan. The typical Latin meal of a big plate of rice, beans and plantains seemed already very complete to me without the meat and dairy. KLB: How were you first introduced to the concept of vegan Latin cooking? THR: The very first time ever was when I first went to Venezuela; I had never seen a vegetarian restaurant in New England, but in Venezuela I found no less than three vegetarian — I’m fairly sure they were even vegan — restaurants. I have no idea if those restaurants still exist but the concept of “vegan” was not unfamiliar there at the time. The second time was my first cooking job in NYC at a vegan cafe called Bachué that existed in Chelsea in the mid 90’s. The owners were Colombian, most of the staff was Mexican and a lot of the food had a Latin bend. They did a wonderful platter of beans, “yellow” brown rice, plantains, avocado and juicy sautéed homemade seitan. It was a hearty, stick to your ribs meal and totally Latin. KLB: You speak and demonstrate at vegan food events often. Have you received positive responses from any non-vegans or those new to the diet who may have caught you at an event? Later on she found me and gushed about how much she enjoyed the tamales and was a new vegetarian interested in being vegan someday. It takes all kinds. I’m just glad they go to vegetarian festivals to learn stuff. KLB: What's the best advice you can give to aspiring cookbook authors about getting published? THR: My story probably isn’t typical. I’m an author first, blogger second. Now it seems like the reverse is how publishing works. Keep yourself immersed in developments within the publishing world as much as you can, because it’s very volatile now and is changing so much these days. Who knows what the standard will be now or next year. KLB: What's your fave spot in NYC to hit for cooking supplies? For an unforgettable vegan meal? THR: For fun and cheap ethnic groceries I adore Trade Fair, a grocery chain in Queens — my favorite [Trade Fair] is in Jackson Heights but there are several locations in the borough. For that great meal there is always Candle 79, but I also love the quirky and calm setting of Hangawi vegan Korean restaurant in midtown. And I can always go for dosas! KLB: What's the worst advice you've ever been given? THR: Not so much advice, but I was warned in high school by a grizzled old teacher that “these are best years of your life”. Pah-leeze, even I knew back then that anything had to be better than high school. And it does get better, so hang in there kids! 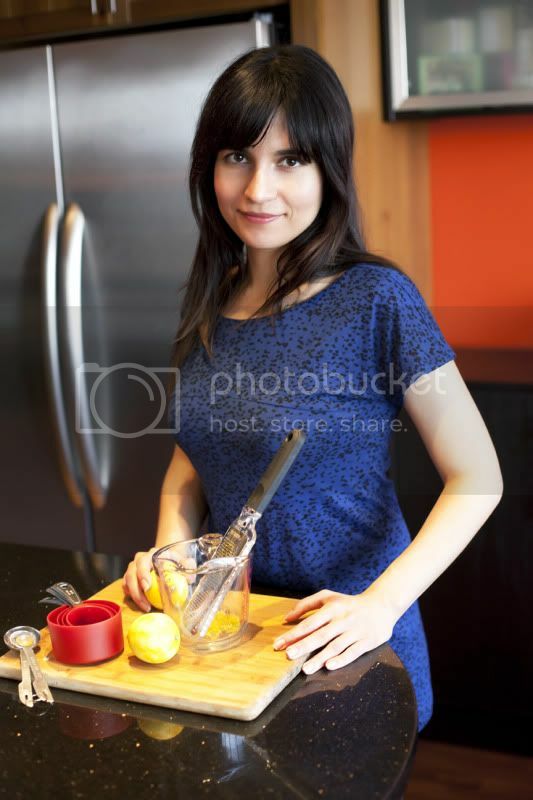 To learn more about Terry and her current and future projects — including soon-to-be-released Vegan Pie in the Sky, the third installment of her vegan baking cookbook series with Isa Chandra — visit www.veganlatina.com. Great interview! I was recently at an festival where Terry did a cooking demo, and I was sorry not to be able to attend her event. Now I'm even more sorry. Hi Andrea! I'm so glad you liked the interview. What a shame you couldn't attend Terry's event -- I'm sure there will be another chance soon since she does so many. Def catch her the next time she's speaking/demonstrating near you!